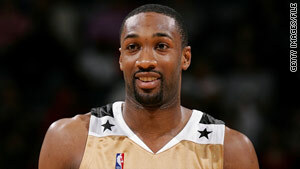 Washington Wizards top scorer Gilbert Arenas says he was playing a joke when he pulled a gun in the locker room. Arenas has described incident as "misguided effort to play a joke on a teammate"
Washington (CNN) -- Washington Wizards point guard Gilbert Arenas has been charged with a felony gun violation after admitting he drew guns in the team locker room in a highly publicized December 21 incident. Arenas was charged with one count of carrying a pistol without a license, according to court documents filed Thursday. "We are aware of the charge filed against Gilbert Arenas today and will continue to follow the ongoing legal process very carefully," the team said. "We will also cooperate fully with the proper authorities and the NBA." The team said it would have no further comment beyond their previous statements on "this serious and unfortunate matter." A hearing is scheduled for 2:30 p.m. Friday in Superior Court in Washington before Judge Robert E. Morin. There was no immediate comment from his attorney, Kenneth L. Wainstein. It wasn't immediately clear when Arenas, who has been indefinitely suspended from the NBA, would be arraigned on the charge. The document that describes the charge is called an "information," which is filed when a plea agreement has been reached. A basketball source familiar with the investigation said the Wizards have been informed that Arenas has reached a plea agreement with prosecutors. The team has been told by Arenas' legal circle that the agreement does not involve jail time, the source said. Arenas' indefinite suspension remains in effect until a separate NBA investigation is complete and Commissioner David Stern reaches a decision, the source said. The league investigation, which had been on hold at the request of federal prosecutors, will now resume, the source said. Arenas described the incident as "a misguided effort to play a joke on a teammate" in a statement released earlier this month. "Contrary to some press accounts, I never threatened or assaulted anyone with the guns and never pointed them at anyone. Joke or not, I now recognize that what I did was a mistake and was wrong." Citing NBA sources, the New York Post reported in December that Arenas and Javaris Crittenton both brandished firearms in the team's locker room. Crittenton's agent, Mark Bartelstein, said his client "hasn't done anything wrong. I'm extremely confident he'll be exonerated." Asked if Crittenton brought a gun into the Verizon Center that day, Bartelstein said, "I'm not going to get into details." He said Crittenton has not met with authorities, nor has such a meeting been requested or scheduled. Arenas, a three-time NBA All-Star, spent January 15 in a voluntary meeting with federal prosecutors at the U.S. Attorney's Office in Washington and with District of Columbia metropolitan police, according to his attorney. Arenas said he told authorities he stored four unloaded guns in his locker at the Verizon Center to keep them away from his children. "I brought them without any ammunition into the District of Columbia, mistakenly believing that the recent change in the D.C. gun laws allowed a person to store unloaded guns in the District," he said. He offered a public apology at the time to the league, his teammates and his fans, saying, "I promise to do better in the future." Some have urged the Wizards to void Arenas' contract, but the source said there is nothing specific in the players' collective bargaining agreement regarding a legal threshold for doing so. League officials believe a felony conviction would give the Wizards better standing in the event that such a decision was made and challenged, but the agreement is unclear. The Wizards have said any such deliberations would not occur until the legal and league processes are complete. CNN's Terry Frieden, Carol Cratty and John King contributed to this report.